Apple introduced the Power Mac G5 almost a year ago, on June 23, 2003. It was a breakthrough in many ways - from its aluminum exterior to its whisper quiet cooling system to its faster-than-any-G4 CPU. 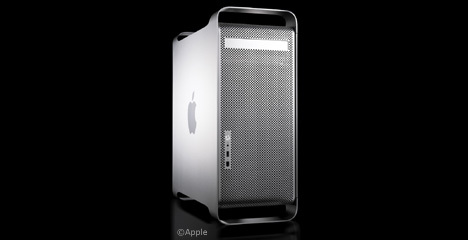 Today Apple upped the ante by releasing a second generation of Power Mac G5 models. On the outside, they look like last year's models, but Apple has made some improvements inside the box. The first improvement is in speed. The fastest G5 now runs at 2.5 GHz, 25% faster than last year's top-end model, and the slowest G5 now sports a pair of 1.8 GHz CPUs, a big step up from a single 1.6 GHz G5. Video is slightly improved, with the Nvidia GeForce FX5200 Ultra replacing the plain old 5200 on the low end and the ATI Radeon 9600 XT replacing the 9600 Pro on the top end. The SuperDrive, standard on all models, is now an 8x device, twice as fast as the 4x drive on last year's models. Last June Apple announced the 1.6 GHz single CPU G5 at US$1,999; today they unveiled a dual 1.8 GHz model at the same price. Considering that a pair of CPUs can provide up to twice the power of a single CPU, depending on the task, gaining 12% more clock speed and a second CPU makes the new entry level Power Mac G5 a real value. As with the 2003 models, the entry-level 2004 model is less feature laden than its faster siblings. Like the 1.6 GHz G5, the new dual 1.8 GHz model has old fashioned 64-bit PCI slots (vs. PCI-X in the faster G5s) and a 4 GB RAM ceiling (vs. 8 GB in the faster models). Considering how much is built into the G5, it's hard to imagine too many things you'd want to put in a PCI or PCI-X slot, so practically speaking it won't matter much (if at all) to people buying the low-end G5. The same goes for RAM. Anyone who needs more than 4 GB of RAM (which is the most a single OS X program can access, although the OS itself can work with more) are unlikely to purchase the entry-level model. Last week the G5/1.6 GHz was selling for US$1,799. With between 12% and 125% more horsepower (depending on how well the second CPU is supported in a specific application), the new dual 1.8 GHz G5 is easily worth the 10% difference in price. I suspect Apple will have to reduce old inventory to the point where the G5/1.6 sells for $1,599 to clear out inventory. Last week the G5/1.8 GHz dual was selling for US$2,499. Because of the PCI-X slots and higher RAM ceiling, it should still be worth a small premium over the new entry-level model. I'd guess Apple could continue to sell the 2003 model for around US$2,099 until inventory is depleted. What had been the top Mac speed is now the speed of the midrange model. The only significant difference between the 2003 and 2004 models is a slightly improved video card and use of 8x SuperDrives. You can now get the performance that would have cost you US$2,999 last week for just US$2,499, a 17% price drop. With essentially the same performance and a twice-as-fast SuperDrive, it's a great value, and I suspect Apple will have to clear out dual 2.0 GHz 2003 models at no more than US$2,399 due to their 4x SuperDrive. In comparison to last week's midrange G5, which sold for the same US$2,499, you now get slightly better video, double the DVD burning speed, and about 11% more horsepower. This again points to a value of about US$2,099 for the old dual 1.8 GHz G5. Twenty-five percent faster. The same price. That's really all Apple needs to say. One processor-bound and memory-bound tasks, the dual 2.5 GHz G5 should finish in about 80% as much time as the 2.0 GHz models take. That easily makes the top-end G5 worth the 20% price premium compared with the new 2.0 GHz model - and makes it the best G5 value ever in terms of GHz per dollar spent. By comparison, the 2003 top-end G5 should sell for no more than US$2,399 - and maybe even $100 less due to the slower SuperDrive. The entry-level model offers 1.8 GHz for US$1,999, or $1,110/GHz. The midrange model runs at 2.0 GHz and retails for US$2,499, or $1,2549/GHz. And the top-end 2.5 GHz model sells for US$2,999, which comes to $1,199/GHz. Where the top-end model definitely offered the best value in terms of horsepower per dollar spent last year, this year it's the entry-level G5 that holds the value crown. If you don't need PCI-X or more than 4 GB of RAM and don't need ultimate speed, the dual 1.8 GHz model is the G5 value champion. The top-end 2.5 GHz model comes in second, and the dual 2.0 GHz model trails by about $50/GHz in comparison. To give it equal value to, the midrange model should retail for US$2,399, which would give all three models comparable value. Last week Apple had refurbished 1.6 GHz G5s for US$1,399, dual 1.8 GHz machines at US$1,999, and 2.0 GHz models available at US$2,399. Today Apple offers new 2.0 GHz 2003 models for US$2,499, the same price as the new 2.0 GHz model - huh? From a value standpoint, the old G5/2.0 should sell for at least $100 less than the new model simply because of the slower SuperDrive. Put those machines at $2,399, Apple, if you want to clear them out instead of selling new models. Although Apple doesn't list any refurbished G5s on their site today, I can't see a refurb G5/2.0 selling for more than US$2,099. Refurbished dual 1.8 GHz models need to sell for US$1,799 or less to be a real alternative to the new entry-level model. And the old single CPU 1.6 GHz G5? I think Apple can continue to sell them at US$1,399, only $150 more than the remaining inventory of 1.25 GHz single CPU G4 systems still on the market. We'll take a closer look at pricing on the 2003 models when we update Best Power Mac G5 Deals, New and Refurb on Friday.